PRAGUE (Sputnik) - The Czech government on Tuesday approved the transfer of over 11 million euro ($12.5 million) in funds to Turkey over the next five years as part of an EU arrangement to assist Syrian refugees in Turkish camps. According to the French media, French president Emmanuel Macron is planning to deploy troops to Syria's Manbij to help local Kurds in resisting Turkish forces. The move has reportedly been coordinated with Washington. Sputnik discussed relations between France and Turkey with Gearóid Ó Colmáin, Paris-based geopolitical analyst and journalist. In 2016, the EU signed its refugee deal with Turkey; it was a plan to reduce deaths at sea but it has led to deteriorating and dangerous conditions for migrants stuck in Greece. The war of words between Germany and Turkey is politically expedient for Berlin, while France is taking on the UK's traditional role as Ankara's champion in Europe, Associate Professor at the London School of Economics Dr. Esra Ozyurek told Radio Sputnik. German Chancellor Angela Merkel - already under fire for having opened Europe's doors to refugees in 2015 - is now facing criticism for having too much influence within the EU, according to a new poll. German Foreign Minister Sigmar Gabriel has flown to Ankara, June 5, in an effort to ease tensions between Turkey and Germany, specifically calling on the Turkish government to allow German lawmakers access to the NATO airbase at Incirlik. German foreign minister Sigmar Gabriel has accused Turkey of imposing an "entry ban" on the vice president of the German Parliament, Claudia Roth, in the highest profile intervention in the growing spat between the two countries. The European Commission has told Poland and Hungary that they will face sanctions if they do not agree to take in their quota of migrants by June, in a sign of growing tensions between Brussels, Warsaw and Budapest. The German interior ministry has confirmed it has received more than 400 applications for asylum from Turkish citizens living in Germany, including NATO staff, diplomats and other government officials and their families in a sign of continuing tensions between Ankara and the EU. European Commission President Jean-Claude Juncker has cast doubt over the likely accession into the EU of Turkey in the light of President Recep Tayyip Erdogan's plans to reintroduce the death penalty by another referendum if parliament rejects his proposal to bring it back. 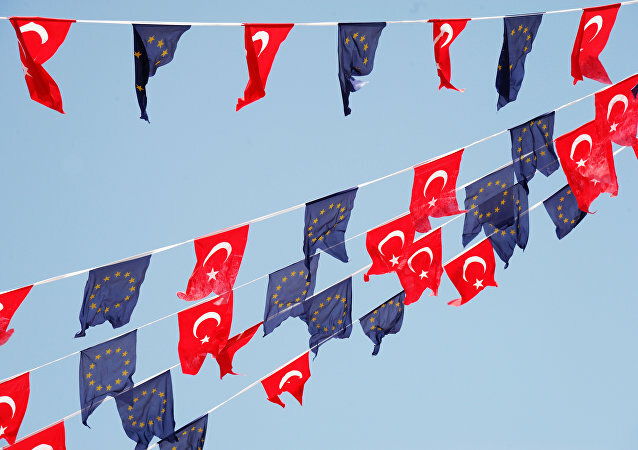 The EU Commissioner for enlargement Johannes Hahn has called for the EU to reset its relationship with Turkey amid growing criticism of President Recep Tayyip Erdogan's increasing grip on power and threats to bring back the death penalty. The Austrian Chancellor Christian Kern has that Brussels-Ankara talks are now "obsolete" following the April 16 referendum and Italy demanding the Turkish authorities release Italian journalist Gabriele Del Grande, who is currently in police detention in Hatay on the Syrian border as EU-Turkey relations decline further. 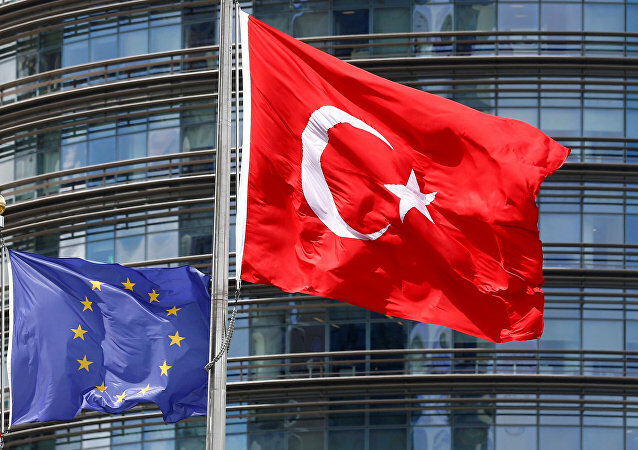 Members of the European Parliament (MEPs) have closed ranks in calling for negotiations over Turkish accession into the EU to be halted in the wake of the referendum in Turkey which is set to hand huge powers to its President, Recep Tayyip Erdogan. Turkish President Recep Tayyip Erdogan has launched a blistering attack on the EU, describing it as a "sick man," threatening to put the issue of Turkish membership of the bloc on the line, following the outcome of the controversial referendum of giving him extended presidential powers, April 16. MEPs have said EU policy on migrants and refugees is "disastrous and hypocritical," one year on from the EU-Turkey migrant deal, which is collapsing amid warnings of a further surge in migrants crossing into Europe this year. The ongoing row between Germany and Turkey has escalated, harsh diplomatic words transforming into decisive action with tangible economic, military and political consequences. The German government is seeking to relocate its military base in Incirlik, and authorities are to investigate allegations of Turkish spying on its soil. The EU-Turkey migrant deal is inching closer to collapse, Turkey's minister in charge of EU integration Omer Celik said on Tuesday, in Ankara. The EU-Turkey migrant deal is not perfect and its implementation continues to be difficult but there are no viable alternatives to it, Chief Spokesperson of the European Commission Margaritis Schinas said Monday. EU Commission President Jean-Claude Juncker told the German newspaper Bild am Sonntag he is confident that Turkey won't ditch its migrant agreement with the EU, and suggested that the Turkish government is not representative of Turks living in Europe.